Enjoy your next holiday at one of the world’s most outstanding diving sites. We are a scenic and tranquil resort nestled in a private area next to Chalok Baan Kao village at the South of Koh Tao. 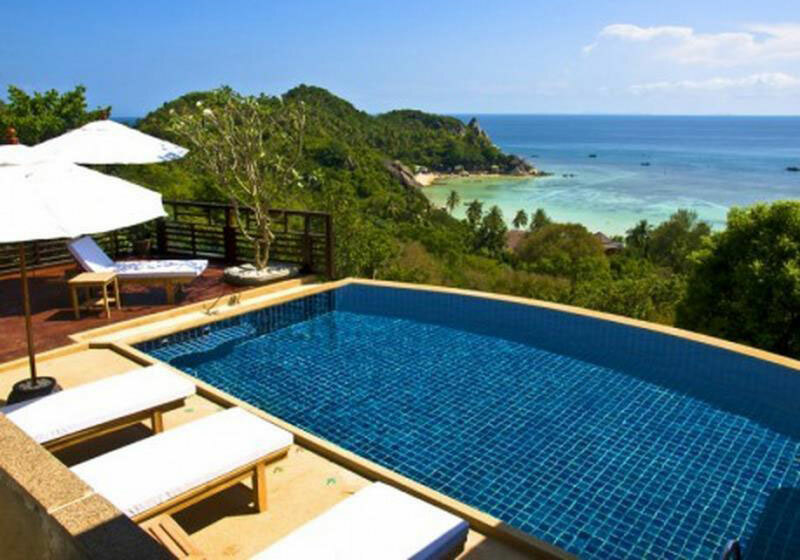 Within 10 minutes (2.5 km) from the Koh Tao pier, you will reach Chintakiri Resort for all the comforts you will need. Chintakiri Resort situated next to a turquoise ocean, against a backdrop of mountains, and surrounded by a lush garden, we provide a relaxing ambience where you can fully recharge yourself before being ready for action in Koh Tao’s wind and waves, especially its rich marine and coral life. Built over 2.5 rai of land (4000 sqm), our resort is located on a hill, allowing guests to enjoy a full breeze and one of the best breathtaking views of the ocean on the island. We offer 19 intimate and comfortable deluxe bungalows made of tropical wood to accommodate our nature-loving guests. All bungalows open out to spectacular sea views. Only a short 200 meter walk to the white sandy beach and pristine ocean, the Chalok Baan Kao beach is easily accessible from the resort. Short Description: Chintakiri Resort situated next to a turquoise ocean, against a backdrop of mountains, and surrounded by a lush garden, we provide a relaxing ambience where you can fully recharge yourself before being ready for action in Koh Tao’s wind and waves, especially its rich marine and coral life. Built over 2.5 rai of land (4000 sqm).